Every hiker faces challenges during a long-distance backpacking trip. It’s much easier to get by with a little help from some friends. In some cases, we have to help the Tiny-Mes. In other cases, the Tiny-Mes help us! 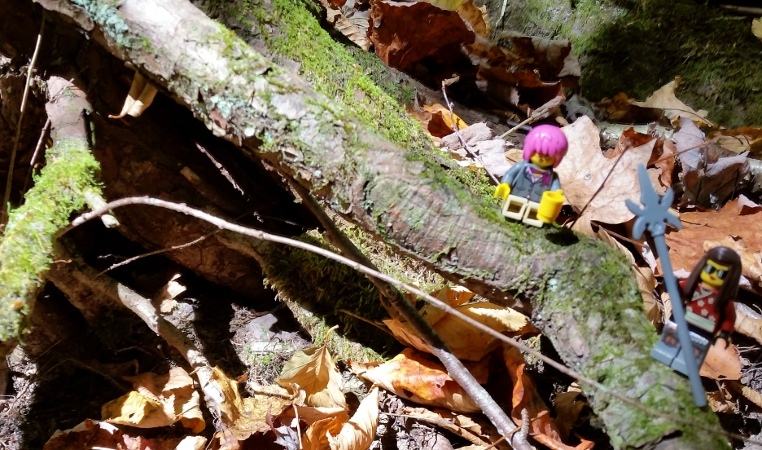 Peeing in the woods is not really a problem for any size hiker. When it’s time for pooping, human hikers hope to be near a shelter. It’s much easier to sit in an outhouse than to dig a hole and squat in the woods. If needed, however, the Tiny-Mes help choose an out-of-the-way spot for our smelly business. Don’t forget to pack out the wipes! 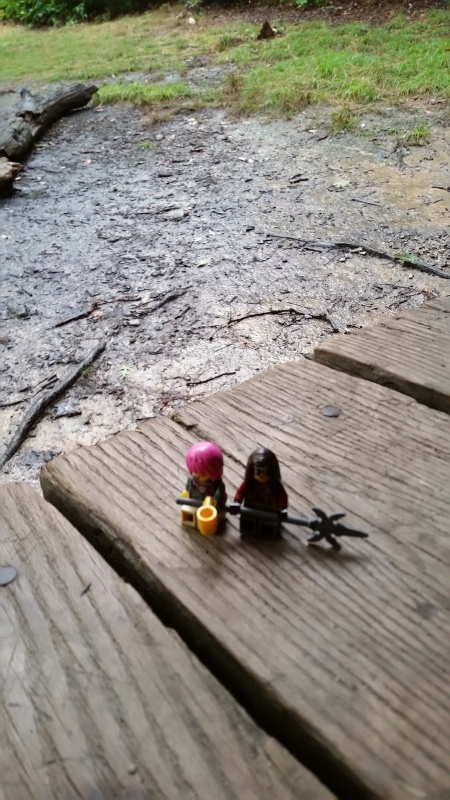 On the other hand, rainy days would be hazardous for our tiny hiking pals. When the trail turns into a river of rain flowing downhill on the easiest path, we merely get our feet wet. Tiny A and Tiny S would be swept away by the run-off. Fortunately, the few rain storms we experienced on this trip were at night. As the rain drummed on the metal roof, we curled up in our cozy sleeping bags to read while the Tiny-Mes watched the storm from the front of the shelter. The Appalachian Trail is not a level, smooth walking path in the woods. It has steep ascents and descents as it makes its way over every possible mountain. The footing can be treacherous for humans and for Tiny-Mes. 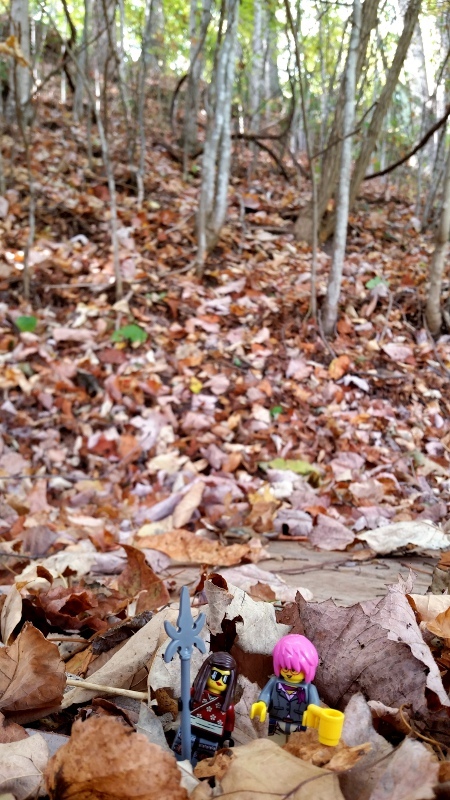 Fallen leaves hide rocks and holes and get slippery when wet. Roots seem to jump up and grab boots or unexpectedly slide feet out from under hikers. Jumbled rocks are either exhausting to climb over or twist and tilt to dump hikers. “Watch out!” cry the hikers in the lead. Luckily for Tiny-Mes, they are so lightweight they don’t have to worry about foot and leg injuries. 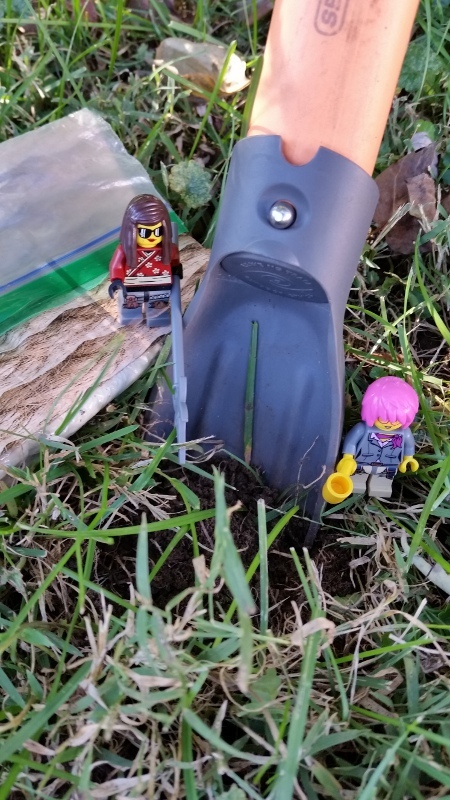 (Those stiff Lego extremities come in handy sometimes!) 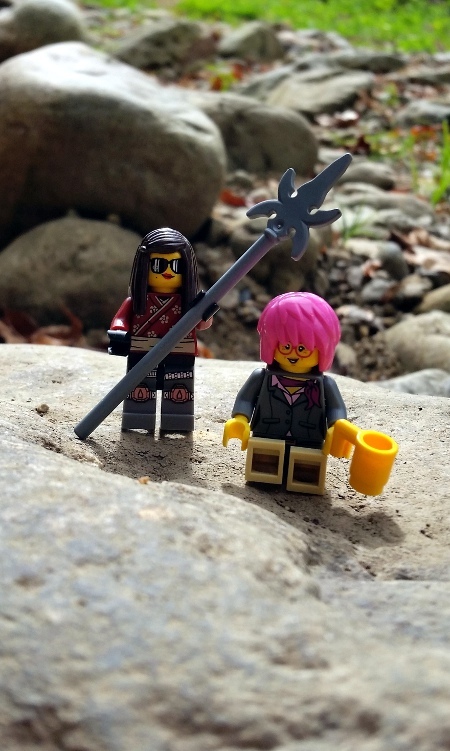 Tiny A and Tiny S know, however, that if we get hurt, their adventure on the AT is also over. 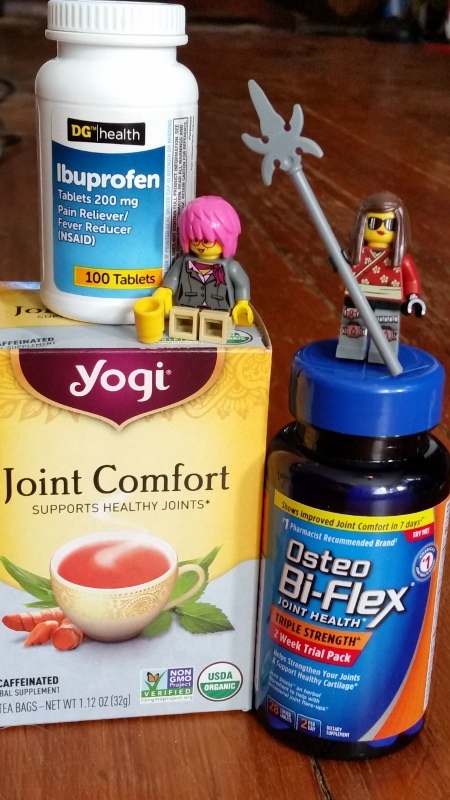 So they remind me (Story Seeker) to take my preventative medicine—joint meds, nightly tea for joint comfort, and “Vitamin I” (Ibuprofen against inflammation). They also help both Andowen and me wrap our feet—with cloth tape or duct tape to prevent blisters and with K-Tape to support joints and prevent rolled ankles, sore knees, and inflamed Achilles tendonitis. It’s always good to have friendly helpers when faced with challenges—big or small!